Newsletter 1602 – Hagiwara Solutions New 2.5″ 6.0Gbps SSDs – Takebishi Europe B.V. 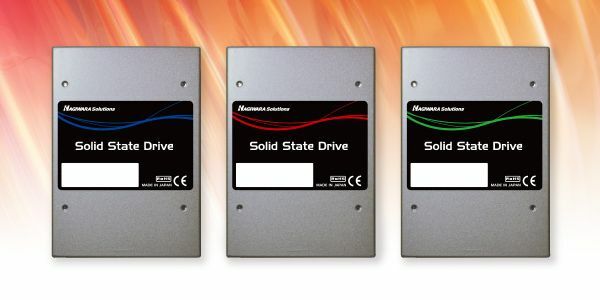 The new Hagiwara SATA 6.0 Gbps SSD model offers unprecedented speed stability! Based on the uniquely developed FTL (flash translation layer), the model reduces garbage collection which causes speed degradation, giving you continuous access at overwhelming speed and stability. The new SATA 6.0 Gbps Model is a high-speed SSD with stable speed and less degrading of data transmission speed during continuous access, while greatly enhancing reliability. This is a new generation SSD that promises a major expansion of the SSD application range for industrial use. The Flash Translation Layer allows for much more stable transfer speeds between the initial and degraded statuses, ensuring sustained constant high-speed transmission even during continuous operation. Thanks to the stable speed of the new Hagiwara Solutions SSDs, users will not experience frame drops during playback and recording even for devices that require high speed data transmission such as 4K movies. In general SATA 6.0G SSDs show big fluctuations in transfer speeds. Although the initial speed is high, due to data cluttering speeds will greatly degrade over time. Thanks to a unique cache algorithm, Hagiwara Solutions has successfully realized superior random write performance up to 100 times higher than before, while at the same time improving reliability. This will greatly enhance response performance and processing speed of the overall system. By utilizing page mapping and 4K alignment processing, memory access frequency of the NAND flash is greatly reduced, thus significantly improving the SSD’s service life expectancy. By preventing the concentration of rewrites on a specific area (block) and internal processing for averaging the rewrites to almost all the areas, the SSD’s rewrite lifetime is greatly enhanced. The information on lifetime, visualization of the drive interior, and memory fragmentation status is available on the fly by using Live Monitoring. 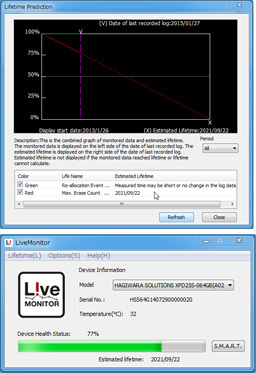 Hagiwara Solutions’ Lifetime Monitoring Software allows for accurate determination of product replacement by predicting device service life and possible failures. Product replacement thresholds can be setup within the software. Lifetime graphs and estimated end of life dates are visually displayed. Lifetime Monitoring logs can be stored if required. Some systems may not perform end-sequence correctly and sometimes system power supply is turned off during data access such as data writing. Power failure during programming and erase operation of NAND flash memory may decrease data retention and cause disk failure. SSDs from Hagiwara Solutions prevent the device breakage by prevention of writes during an unintended power shutdown. The access status from the host is always recorded using a uniquely designed algorithm. Even when restarting from a power shutdown the system can recover immediately. For more information, please contact Takebishi Europe by e-mail or call us on +31-20-705-5150. Please also visit our website!